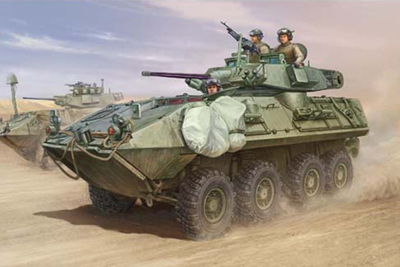 1/35 US LAV-A2 8X8 wheeled armoured vehicle Discounts Apply ! TRP1521 - TRP1521 - 1/35 US LAV-A2 8X8 wheeled armoured vehicle model kit. The LAV-A2 8X8 wheeled armoured vehicle comes with photo etch parts and newal tooled barrel.